A Tonk's Tail... err, Tale...: Sunday's Shelter Sweetie: Swatch! "Arrr, Mateys! I'm Swatch and I'm ready for Meow Like a Pirate Day! Or to be a swashbuckling pirate this Halloween. All I need is a kitty sized eye patch and I'm good to go. Some people call me a Special Needs kitty because I have one eye. And I hear whispers that people think I'm less adoptable because of it. Arr, I say! Make'em walk the plank! I get around just fine! And when I get time out of my kennel, I jump up and down off the chairs, visit all my buds in their kennels and can spot a cat treat a mile away with my remaining eye. I'm still living the good life, so no pity party for this little dude, 'k?" "I'm friendly - which goes without saying for orange tabbies. We are known for our friendly personalities. In fact, a lot of people with very little cat experience are advised to choose one of us as we're very easy-going guys and would be a great practice cat. Notice I said guys, because there are hardly ever any female orange tabbies. Maybe once in a blue moon, but Mother Nature simply doesn't make them. That's okay though - you have ME! And see? I'm a very educational fellow to have around, too. I especially like wand toys that I can chase or catch. Do you have any toys like that at your house? I'd love to see 'em. And if the answer is "no", not to worry, we can buy one at the Great Plains gift shop before we go home. I'm so looking forward to meeting you - thanks for reading about me. Swatch is available to come home with you and zoom-zoom-zoom around your living room, TODAY! 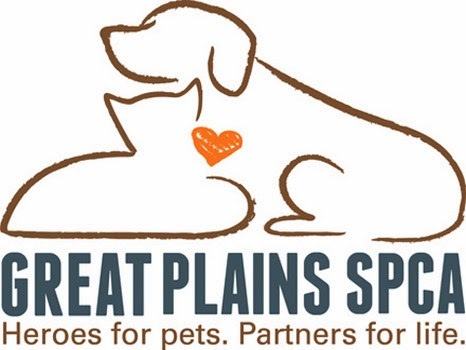 Come meet him at the Independence Campus of Great Plains SPCA. Swatch is a cutie! He sounds like a lovable, fun boy and someone will be lucky to have him in their family. I guess he would be considered "special needs" but that's only because you have to remember not to sneak up on his left side....if you could sneak up. Just because he can't see as much on his left side doesn't mean he can't hear you and his whiskers can't sense the air movement! Oh my gosh, it would be so much fun to play with him and see how sensitive his senses are....not to tease him, but to realize that a cat with one eye is not disabled or in any way less adoptable. I hope he finds his perfect forever home soon. OMD sweetie we so hope everything works out OK. Paws tightly crossed over the pond. Have a serene and easy Sunday. 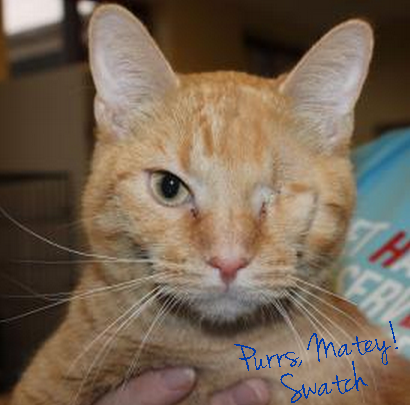 I don't see why having just one eye makes Swatch special needs - he sounds like a perfect kitty to me! Swatch is adorable....we sure hope he finds a pawsome forever home soon. Swatch, we think you look dashing with your one eye. It looks like you are giving us a wink, and that's endearing! You sound wonderful, pal. We're crossing our paws and fingers that you find a forever home real soon. Swatch buddy...you are one drop over good looking mancat...that 'special need' category must be a peep idea...right?